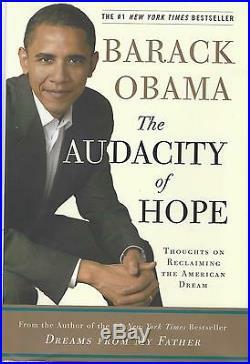 America's first Black President's notable book, The Audacity of Hope. Hardcover with dust jacket, 6 1/2" x 9 1/2", 375 pp. Signed in black felt tip on the cover page. First edition marked twice, but a later printing. 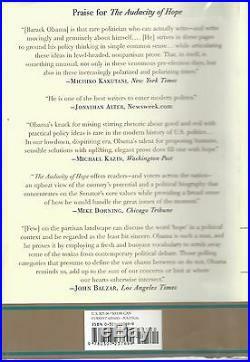 Comes with a color photograph of the young lady who once owned the book shaking hands with the President in Oklahoma City in March 2007. The photograph has an unfortunate vertical crease as it has been stored inside the book. Our goal is to please every customer. We are pleased to be members of The Manuscript Society, Universal Autograph Collectors Club and The Ephemera Society. 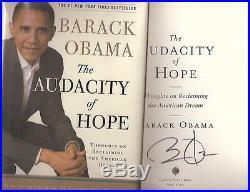 The item "Audacity of Hope, Barack Obama, First Edition, Signed" is in sale since Thursday, July 26, 2018. This item is in the category "Collectibles\Autographs\Political\Presidential". The seller is "bminnocci6mtm" and is located in Boston, Massachusetts. This item can be shipped to United States, Canada, United Kingdom, Denmark, Romania, Slovakia, Bulgaria, Czech republic, Finland, Hungary, Latvia, Lithuania, Malta, Estonia, Australia, Greece, Portugal, Cyprus, Slovenia, Japan, Sweden, South Korea, Indonesia, Taiwan, Thailand, Belgium, France, Hong Kong, Ireland, Netherlands, Poland, Spain, Italy, Germany, Austria, Bahamas, Israel, Mexico, New Zealand, Singapore, Switzerland, Norway, Saudi arabia, Ukraine, United arab emirates, Qatar, Kuwait, Bahrain, Croatia, Malaysia, Chile, Colombia, Costa rica, Panama, Trinidad and tobago, Guatemala, Honduras, Jamaica.